How much does it cost to travel to Phuket? How much money will you need in Phuket? ฿3,012 ($95) is the average daily price for traveling in Phuket. The average price of food for one day is ฿596 ($19). The average price of a hotel for a couple is ฿3,316 ($104). Additional pricing is in the table below. These average travel prices have been collected from other travelers to help you plan your own travel budget. How much money do I need for Phuket? Phuket Island is the tourist mecca of southern Thailand. Known for its beaches and resorts, the island brings in a massive amount of travelers from all over the world, year round. Although the beaches are beautiful, Phuket has also become more westernized and tourist-oriented in recent decades, leaving many travelers to venture elsewhere to find that amazing beach with a more authentic Thai vibe. However, Phuket Island is quite large, and hidden gems can still be found. Phuket is known for its beach resorts, and near the coast is where most people tend to congregate. Hotels and resorts along the main beach areas are surrounded by restaurants, shops, and street vendors, which sell tours and trips to pretty much anywhere. Various temples and wats can be found around the island. At the top of Naka Kerd mountain is a large white Buddha with views of the surrounding island and sea. The Crocodile Farm on Chana Charoen Road gets good reviews from visitors, as does the Phuket Butterfly Garden and Insect World. Within the town of Phuket, various historic sights and buildings can be found (with tour guides available), although history and culture enthusiasts generally skip Phuket Island in favor of more cultural locations, some interesting sights can still be found. The Ranong Market brings in many locals and visitors alike, as it's a great place to get some cheaper food for your stay at the beach. Old mansions in the town are still intact, dating back to the 19th century, and many are now shops. Various wats (temples) are around town with interesting detail, and the town also has a cultural museum. The Thai Village and Orchid Farm serves a typical Thai lunch and offers a cultural show with dancing, boxing, a display of traditional customs, and elephants. Just outside of town, there's even a zoo! 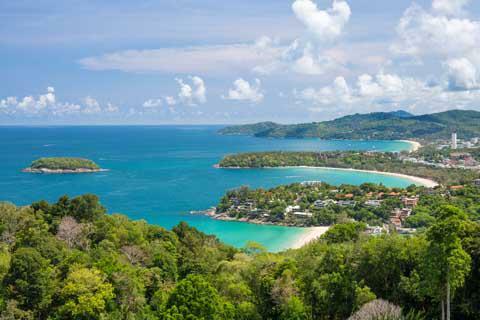 The western coast of Phuket Island is why visitors flock to this world-famous destination. The coast is not as rugged as some other parts of Thailand (and many visitors say it's actually not as beautiful), but the water is clear and blue, and the beaches are wide, with plenty of room inland for larger resorts, shops, and restaurants to thrive. Patong beach is the most popular and most crowded. It contains a large number of hotels, shops, restaurants, bars, and clubs. The nightlife here is very active, and tourists are extremely prevalent. Karon beach is the second most popular, and has a similar vibe as Patong, just a little less busy. Kata, at the southern end, is busy, yet not too busy, for most travelers. The beach is still nice and the location is close enough to visit the touristy areas, if the desire strikes. Chalong Bay is home to most of the yachts and also the departing point if you're planning to explore some other islands. If you're looking for a quieter alternative, head to Kamala, which is north of Patong. To the north are several other beaches that are quieter, also offering various amenities and access to some local culture. Rawai, at the southern tip, offers a relatively quiet seaside vibe with great sunset views, seafood restaurants, and local culture. Phuket town is in the southeastern section of the island, and is the largest town. It has hotels, shops, and restaurants, but these tend to cater to budget travelers and the locals. Generally most transportation options to and from the island go through Phuket town, with the exception of the airport, which is on the northern side of the island. Water activities are quite popular, for obvious reasons. Diving and snorkeling are some of the main activities. To find a dive shop or a tour company offering dive services, just look down the street. Boats are available for day trips out to sea for diving, snorkeling, fishing, or partying. Boat tours to the surrounding islands in Phang-nga Bay are also popular. These trips herd tourists to fascinating, yet crowded, destinations such as "James Bond Island" and other geological wonders. To visit these islands at a lower price, and often during less crowded times, search for a tour operator in Phuket town or away from the main touristy areas. Research and ask questions about the number of people on the boat, the type of boat, and other safety factors. While smaller longtail boats are safe, they are only meant for a small group of people. It's possible to rent a motor scooter to explore the island on your own, but pay attention to the rules of the road. Just as in the rest of Thailand, spas and massage parlors are popular. Day spas catering to western tourists offer all types of luxurious amenities, while smaller shops tend to just do massages. For obvious reasons, seafood is quite popular on the island, and is generally very good when prepared using traditional Thai recipes. Many travelers claim that the Thai food on Phuket is not as authentic as in the rest of Thailand, mainly due to the number of surrounding tourists. While this may be true, the cuisine is very diverse, as food from all over the world is available. Many westerners have set up restaurants catering to travelers from their home countries, too. This may be good if you've spent a lot of time in Thailand and are tired of the food. Otherwise it may be a huge disappointment. Songtheaws (pick-up trucks with covered backs) act as local buses around the island. They are run by the government, although many taxi and tuk-tuk drivers will claim they are not running (or don't exist) in order to get your business. Tuk-Tuks in Phuket act as taxis. They are basically small red minivans that aggressively seek business from tourists, but generally are quite efficient. Negotiate before you depart! Regular "car" taxis are also common. Motorbike taxis are also available, and the drivers wear bright vests. If the driver does not have such a vest, then it's not an official taxi.